It is official, Chip Foose will appear as a special guest at the 46th Annual O’Reilly Auto Parts Boise Roadster Show presented by Les Schwab Tires. The show takes place Friday-Sunday, March 9-11, 2018, at Expo Idaho. Excited might be an understatement. We are positively thrilled to reveal that Chip will be returning to Idaho’s capital city for the first time since his last trip to the show in 2005. Highlighting a career as one of the industry’s leading designers and builders, Foose led a team of craftsman in the hit television show Overhaulin’, along with countless appearances on an assortment of other t.v. programs. He will be joining Ken Reister with two remarkable builds out of Foose Design. Ken’s Colorado-based `36 Ford will be displayed together with his matching scratch-built chopper motorcycle that is breathtaking. The credentials on these two builds is nothing shy of jaw-dropping. 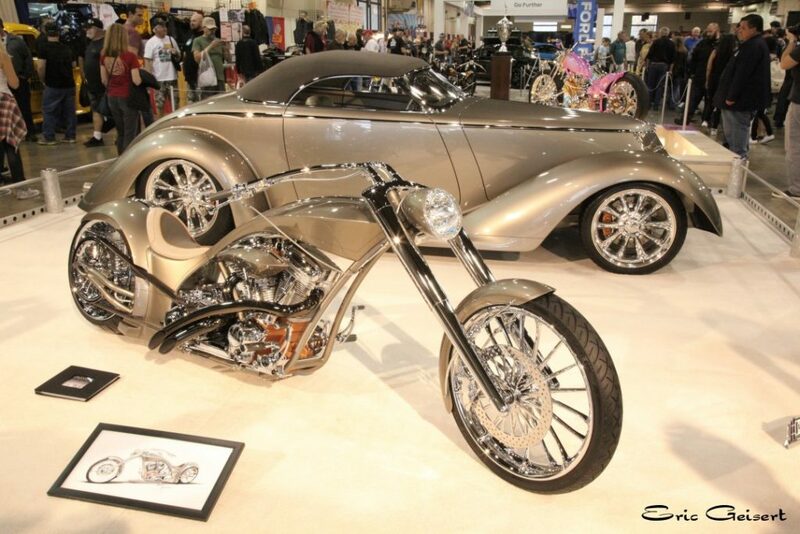 The “Impression” full-fendered roadster is a former America’s Most Beautiful Roadster winner and the bike captured the America’s Most Beautiful Motorcycle title at last January’s Grand National Roadster Show! Seeing these two vehicles in one display is a stunner. “Impression” has a list of titles that is likely unrivaled by any previous build in the show car industry. The car is a former Ridler winner from the Detroit Autorama; Goldmark winner in Boise; Street Rod d’Elegance winner at Goodguys Del Mar; and America’s Most Beautiful Street Rod at Goodguys Pleasanton, among many others. Show hours are: noon till 10 pm on Friday. Saturday is open from 10 am – 10 pm on Saturday. And Sunday will be open from 10 am till 5 pm. Show awards are at 5 pm Sunday. Thanks to Eric Geisert for providing the display photo from the Grand National Roadster Show (2017). And thanks to David Jothen for the header family photo taken at the Portland Roadster Show (2016).